A video made by a CRRS-sponsored student, Yang Xue-Qin. I was born in a rural village in Guangxi, China. My parents are farmers and our life is hard as our livelihood depends on the weather. When I was about 5 or 6 years old, I had to take care of my younger siblings while my parents laboured in the fields. I did all the chores that the other village children would do such as cooking, cleaning, washing clothes and feeding the pigs while carrying a young sibling on the back. While I did not complain about these tasks I did not understand why our relatives could yell at me or beat me without reasons. I could not forget the horrendous sight of all the bruises and wounds from the beatings or the near-death experience from being thrown into the well. The countless quarrels and fights between my parents became nightmares that haunted me and kept me up at night. These painful experiences led me to believe that love did not exist in the world. I became a quiet and emotionless person, not knowing how to care for or love others as my own heart was filled with sadness. I felt that life was not worth living and the idea of suicide crept into my mind. When I was not feeling depressed, I would tell myself to study hard with the belief that I would not be bullied when I got admitted to a university. Despite all of the hardships that I endured, believing that being admitted to university motivated me to achieve my goal of a high score. My score of 717 (second best within the county) granted me an admission to the Chongqing Medical School in Sichuan. My joy was short-lived however, as the high tuition fees became a huge obstacle for my family. After exhausting all means available to us (borrowing loans and sending my young sisters to work in Guangdong), we could barely raise enough for the first two years’ tuition fees. As a last resort upon hearing about my difficulties, my teacher (Mr. He) wrote a letter to Dr. In-Sing Leung at the CRRS asking for assistance. I was not expecting to hear a reply and had given up hope. Dr. Leung immediately sent us a reply telling us that the CRRS would provide me with financial support! Dr. Leung even called us from Chengdu where he was lecturing. When he asked me to travel to Chongqing to get the funds, I gave a poor excuse and refused the offer as my parents were afraid that it was a scam and I would be kidnapped. We thought it was too good to be true. Our relatives were avoiding us knowing we needed money and we didn’t understand why some strangers from Canada would be willing to help us. It would be too horrendous to imagine being sold to become a prostitute in some foreign country. Who would have thought that Dr. Leung did not give up on helping me? He came all the way from Canada to visit our family in Wuxuan (a small county in Guangxi) with May Soo, Lee-ma-ma (Shirley) and Lee-ba-ba (Daniel). They came to give the tuition fee to our family. I was absolutely stunned by this unbelievable good deed from heaven! The Society not only sent me financial support, but the unthinkable happened, I was being loved and cared for like a daughter. Throughout the years I received numerous letters and email messages of encouragement. A special visit to me also occurred in June 2008. “Oh, why would so many make special efforts to care for an insignificant girl like me?” I asked. “You are important to us!” answered Dr. Leung. I felt overwhelmed and cried in the middle of the night thinking of his answer. “Am I not someone being yelled at and beaten by others whenever they want to? Why would these strangers come from thousands of miles to fulfill their promise of helping and loving me and tell me that I am important?” My icy cold heart which was filled with darkness slowly melted. Suddenly, there were rays of sunshine which brightened and warmed up my life. Oh, there is someone who loves and cares for me! Love does exist… Since then, I no longer feel insignificant and depressed; I learned how to face life bravely with a smile. As you know, there are countless young girls from rural villages who cannot go to school. After completing grade 9 many will go to work in a factory in Guangdong for a few years and then they will get married and raise a family. I stubbornly refused to submit to this ‘life cycle’ and I yearned to attend senior high and university to earn an education. Without the assistance from the CRRS, I would not be able to achieve my goal. I clearly know that without the unconditional love from the CRRS, I would not have been able to overcome my depression and would not have had an opportunity to get to know God. I am a new person who smiles all the time and who wants to love and care for people. Currently, I am working at Wuxuan’s People’s Hospital as a paediatrician. I feel fulfilled and happy when the children become healthy after the medical treatments. Although there are tired and stressful moments, I always feel energized when I think of the love from the CRRS and the Master of my life who is in heaven. I feel so blessed and thankful for the CRRS’s support in achieving my medical training so that I can serve the children of my hometown. I have discovered that there is unconditional love in the world that can cast out the darkness and light up one’s life. Throughout my life, I will continue to spread this love to motivate others. You will be touched if you could see all the changes the young children in Guangxi have experienced through the support from the CRRS. You will be deeply moved by their life stories. Original written in Chinese by Mei-Ling Huang. Mei-Ling was born to a poor farmer’s family in Wuxuan, a poor county in Guangxi, China. Her parents work very hard to raise their 4 children. 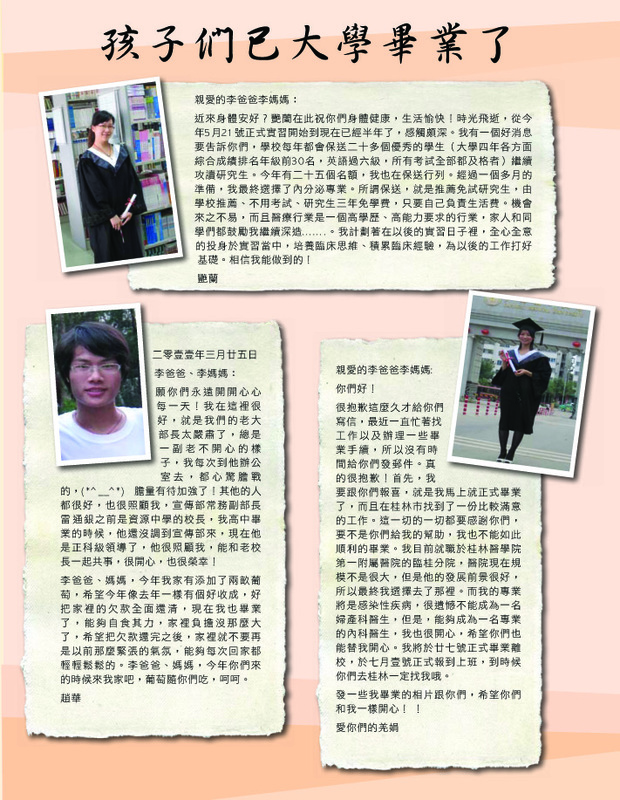 In 2005, Mei-Ling got admitted to Chongqing Medical School in Sichuan. The family tried everything – by borrowing and sending Mei-Ling’s young siblings to work in Guangdong in addition to live stingy live – in order to raise enough tuition for the first two years of her five-year medical program. In 2007, Mr. He, a CRRS ‘Teacher’s Certification Program’ recipient, who taught Mei-Ling in high school wrote to CRRS to pledge for financial assistance. CRRS offered Mei-Ling sponsorship that same year (her third year at the Medical School). In 2009, Mei-Ling completed her medical training, specializing in Paediatrics. After graduation, she worked at “Bei-bei Children’s Clinic”. Mei-Ling returned to Wuxuan in May 2011 and started to work as a paediatrician in Wuxuan People’s Hospital. Mei-Ling is thrilled that she could serve the people in her home town – for her, it is a dream comes true. The following are letters to Project Shine participants written by students in China.